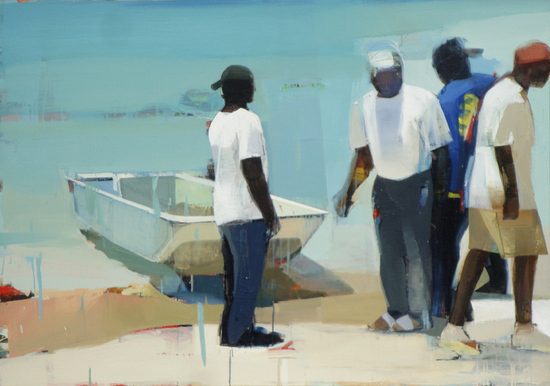 Sujas Bhujbal, "Hanging Out," 2012, oil on canvas, 60" x 42" During a 2011 trip to Cat Island in the central Bahamas, artist Suhas Bhujbal found something he craved: peace and quiet. The island's lifestyle -- one in which people gather on the beach and enjoy each other's company -- reminded him of his childhood in India. "I appreciate the simplicity in life," he comments. "I paint what I see, experience, and feel. It is really about falling in love in that moment and bringing that on the canvas in a visual form." 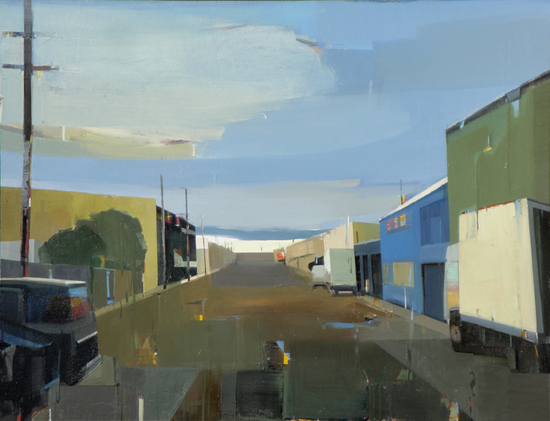 Sujas Bhujbal, "A Quiet Town 123," 2012, oil on canvas, 50" x 65" Bhujbal, who has lived in the San Francisco Bay Area since 2001, is well known for his semi-abstract images of urban environments, many of them suggestive of his native India. He is a keen observer of what architecture has to say about a town's inhabitants, to the point that his buildings sometimes seem at least a bit human. "When I see a building that strikes me," Bhujbal notes, " I suddenly stop and find myself standing and staring. Sometimes I feel something is happening. Even though the building cannot talk, I feel it is saying something to me." 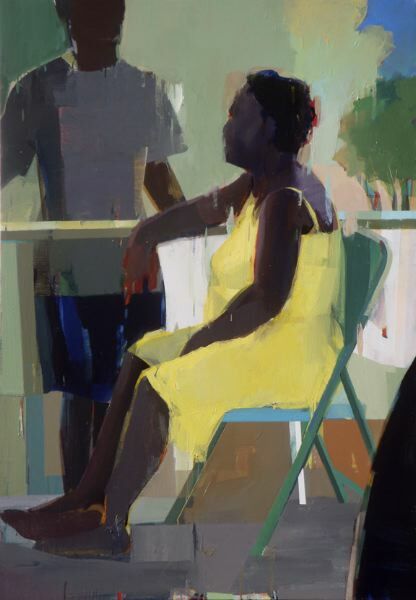 Sujas Bhujbal, "Getting Ready for the Day," 2012, oil on canvas, 42" x 60" Besides providing a new setting for his work, the Bahamas revitalized Bhujbal's interest in painting the human figure. The artist's handling of the figure overlaps nicely with his approach to architecture: he treats them both with a searching, process-oriented approach to his materials that allows him to improvise. Interestingly, this figures sometimes have a hint of architecture about them, and his buildings are distinctly organic. In the paintings inspired by his trip to Cat Island, there are some particularly elegant figure ground relationships in which clearly delineated human forms are set against broadly brushed color fields and more than a few drips. The Bahamas paintings also demonstrate that Bhujbal is able to render the feeling of light with considerable confidence. 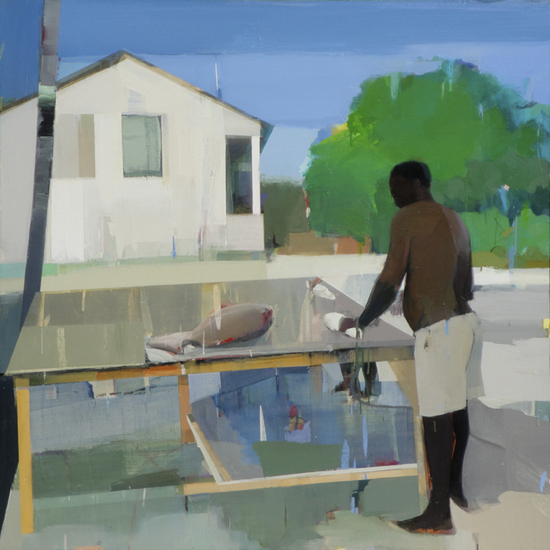 Sujas Bhujbal, "Had a Good Day," 2012, oil on canvas, 48" x 48" In his painting "Had a Good Day," Bhujbal gives us a single figure engaging in a simple act: repairing a net while a freshly caught fish glistens on his table. The image has a vitalizing freshness and its colors -- silvery greys, cool blue and a burst of fresh green -- perfectly compliment the umber silhouette of the solitary fisherman. Although he has been drawing figures for some time, including portraits of riders on the Muni train he takes to his studio, Bhujbal says that his vacation in the Bahamas was an "amazing experience" that gave him a new impetus to develop figural compositions. On Cat Island Bhujbal found something he had lost touch with: a simpler life more connected with nature and less in touch with modern distractions and temptations. Since his return home the positive energy of the experience of the trip has continued to resonate in a his work, which includes a new series of paintings of single figures observed from life. Like the fisherman in "Had a Good Day" Suhas Bhujbal enjoys his work and is at peace with his surroundings.